Here's an "interesting" item for sale on ebay. 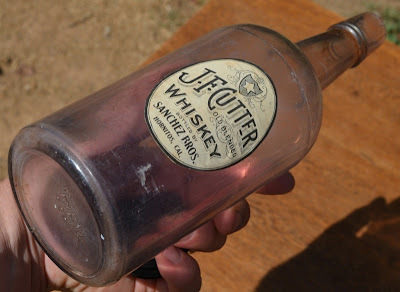 A turning purple quart size whiskey shaped bottle with several scratches, a scuff or two and a perfect paper label. Take a look at this beauty: http://www.ebay.com/itm/RARE-ANTIQUE-WESTERN-J-F-CUTTER-WHISKEY-BOTTLE-SANCHEZ-BROS-HORNITOS-CALIFORNIA-/150907827270?pt=LH_DefaultDomain_0&hash=item2322ceb446 and you be the judge. Step Right Up……to the 2012 Downieville Antique Bottles & Collectibles Show and Sale! A bottle collector’s paradise! Coming to Downieville on Saturday, September 8 is the annual antique bottles and collectibles show at the Downieville School Gym! Early Lookers are welcome at 8:00am-10:00am for a $10 fee donation. The show is free to the public from 10am-3pm. This show has gained much popularity over the years as one of the west coast’s favorite shows! Known for its small town hospitality and friendliness, the Downieville Antique Bottle Show has attracted buyers and sellers from Utah, Texas, Oregon, Nevada and Washington states. Many desirable bottles have changed hands at the Downieville Show and lots of great treasures have gone home to happy buyers. In addition to antique bottles, shoppers will find a great selection of trade cards, advertising tins and signs, ephemera, and so much more. There is something for almost every kind of collector! And don’t forget to buy your raffle ticket for some great prizes! This year’s show will feature displays of “The Silver Seventies”. Bottles and related items from the 1870’s; whiskies, sodas, medicines and drug stores will be on display. This was an important time in history, resulting in the discovery of silver as prospectors rushed to the Nevada area, scrambling to stake their claims. Downieville is located on historic Highway 49 in the northern gold country. 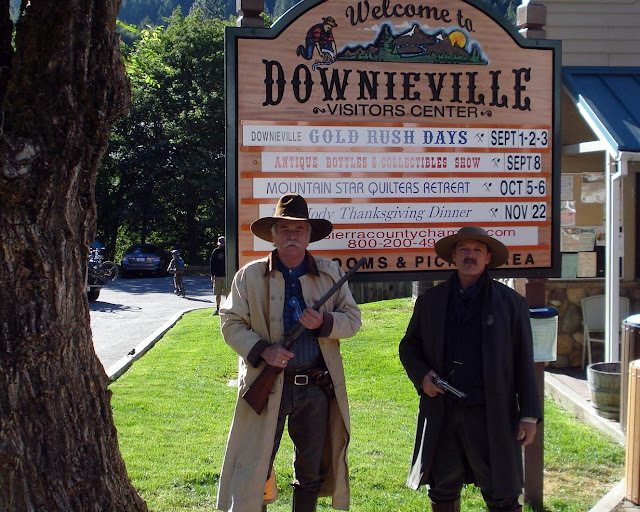 If it’s your first time attending the Downieville Show, expect to slow down and step back into time in this quaint little gold rush community. You can park and walk to the bottle show, museums, shops, restaurants, saloon and wine bar. For dealer or show information, please call Rick & Cherry Simi (530) 289-3659 or email: ricksimi@att.net. We hope to see you here in Downieville!